This semester I promised my photography professor that I would bake him something and I was told by his roommate that he loved snickerdoodles. So, natually, I wanted to make him something a little bit more unique than just your average cookie; I decided to go with a snickerdoodle cupcake instead! The little cookies were great when dipped through the frosting and the cupcakes were so addicting! I wish I could have posted this recipe before Christmas, but there is still time to make these for New Years! 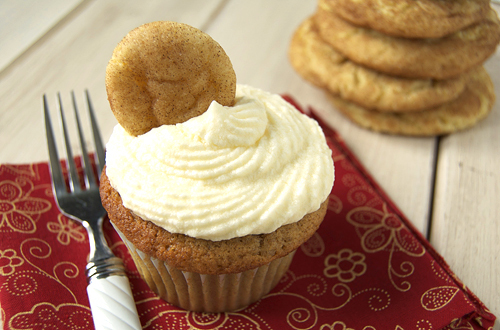 Click on this Stuffed Cookie Dough Cupcake post for the frosting recipe. Mix butter, 3/4 cup sugar and eggs in a large bowl until well combined. Combine the flour, cream of tartar, baking soda and salt in anther bowl. Blend the dry ingredients into the butter mixture until dough forms. Chill the dough in a refrigerator (about 15 minutes). In another small bowl, combine the remaining sugar and cinnamon. Roll the dough into desired size and roll in the cinnamon sugar until covered (remember to make miniature cookies, about 1/2″ dough balls if you are using them for the cupcakes). Remove from the tray and let cool on counter. Yum, I love snickerdoodles. I’ll bet the cupcakes are awesome! Such a cute idea! I bet your professor loved these! I have absolutely no desire to give up sweets to welcome the New Year. More is better, I always say… so this recipe may just be the perfect thing for me. 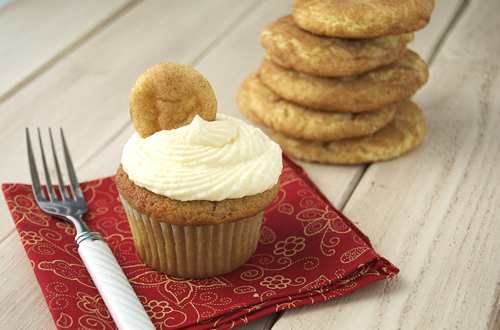 you had me at snickerdoodle, cupcake form oh my goodness!!! Oo I have had chocolate chip cookie cupcakes with minis for toppers but not snickerdoodle. I love it! Those little cookies really make your cupcakes look extra cute. I have a sweet treat linky party going on at my blog and I’d love it if you’d come by and link your cupcakes up. http://sweet-as-sugar-cookies.blogspot.com/2011/12/sweets-for-saturday-50.html. It’ll be open till Monday night. Oh my goodness this sounds so amazing!! How freakin cute are those mini snickerdoodle cookies?! Awesome recipe, it’s making my mouth water! Im not sure what I think is more awesome, the tiny little cookies in the cupcakes or that you have a photography professor. 😀 These are adorable and sound totally delicious.